1 Welcome to Finland! 2 Talking About Others in Finnish 3 What is That Finnish Thing? 4 What's That in Your Finnish Cup? 5 How are you Doing in Finland? 6 May I Have Some of that Finnish... Something? 7 Let Me Have Some Delicious Finnish Blueberry Pie! 8 Have You Lost Your Favorite Finnish Coffee Mug? 9 Is this your Finnish cousin? 10 Can your Australian Uncle Speak Finnish? 11 I Don't Like the Rain in Finland 12 Talking About your Hobbies in Finnish 13 Give Me a Lesson in Finnish! 14 Where Did My Finnish Book Go? 15 Greetings from Finland! 16 Come to Finland With Me! 17 Do You Like Finnish Movies? 18 Put the Finnish Candies on the Table, Sit Back, and Relax! 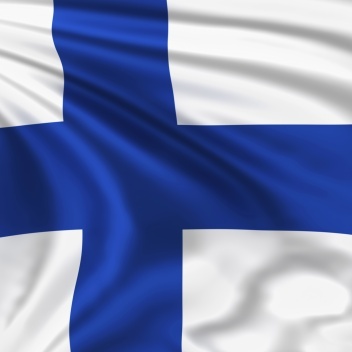 19 Do all Finns have Blue Eyes? 20 Do You Have Any Finnish Dogs? 21 How Many Finnish Christmas Cards Are You Sending? 22 Who Took the Finnish Book from the Table? 23 Let's Make a Finnish Snowman! 24 Feeling the Cold in Finland 25 Look What I Got From Santa in Finland! Want to Understand & Master the Finnish Dialogue 100%? Gina:Hi everyone, Gina here! Welcome to FinnishPod101.com! This is Absolute Beginner Season 1, Lesson 1 - Welcome to Finland! Gina:In this lesson, you’ll learn about how to greet someone and introduce yourself in Finnish. Paula:The conversation takes place at the airport. We have a young Australian exchange student who has just arrived in Finland. The mother of her host family is meeting her at the airport. Gina:They have never met before, so they will be speaking standard Finnish. Paula:Okay. Let's listen to the conversation! Gina:So, Helen came to Finland as an exchange student. What do you think happened between her and Liisa besides what we heard? Did they shake hands, hug each other, kiss each other on the cheek, or what? Paula:They probably just shook hands. That’s the norm between people who don’t know each other well in Finland. Gina:No kissing on the cheeks? Paula:No, Finns don’t do that. Even hugging is mainly restricted to relatives and close friends, especially girls. Gina:What about boys and men? Paula:Well, they usually stick to handshakes among themselves, but they may hug women who are close to them. Friends usually don’t shake hands, though. Gina:Hmm. Let me see if I can pull this together. If you don’t know the other person, shake hands unless you’re both young. If at least one of you is a woman and you are close friends, you may also hug one another. Paula:Exactly. It’s also good to keep in mind that apart from formal situations, where you do need to shake hands, it’s often perfectly acceptable to keep your distance and just greet the other person. You can also let the other person go first and follow their lead. Gina:Okay, good to know. Let’s get to the vocabulary now. Gina:Let's have a closer look at the usuage for some of the words and phrases from this lesson. Paula:This time we’ll only be looking at the phrase ‘Hyvää päivää’. Gina:Literally, that’s “good day” in English, and it’s the standard daytime greeting. Paula:That’s right. It has the words ‘hyvä’, or “good”, and ‘päivä’, or “day”. As you may have noticed, it’s not ‘hyvä päivä’ but ‘hyvää päivää’. The last vowel in both words is long. That’s because the words take a certain case ending, but we’ll look at that more closely in later lessons. For now, just learn this as a set phrase. Gina:When would you use this greeting? Paula:Well, you can use it for most of the day, maybe from 11 in the morning or noon until about 6 or 7 pm. Gina:And what would you say in the morning? Paula:‘Hyvää huomenta’, which is literally “good morning”. You can say ‘Hyvää huomenta’ up until noon. Gina:What about in the evening, then? Paula:In the evening, you would say ‘Hyvää iltaa’. ‘Ilta’ is “evening” in English. When you’re going to bed, you say ‘Hyvää yötä’. Again, ‘yö’ is “night” in English. ‘Hyvää yötä’ is not strictly speaking a greeting, though, because you don’t say it when you meet people, only when you are going to bed or taking your leave late at night. Gina:In the dialogue, Helen omitted the first word. Is that common? Paula:Yes, it’s very common to say just ‘Päivää’, ‘Huomenta’, or ‘Iltaa’. With ‘Hyvää yötä’, though, you often say ‘Öitä’ rather than ‘Yötä’. ‘Öitä’ is the plural form of ‘yötä’. Gina:Is there a difference in politeness? Paula:Well, maybe a small difference, but nothing you should worry about, really. Gina:OK, sounds simple enough. Let’s go to the grammar. Paula:In this lesson, you’ll learn about the the phrase Minä olen A, which is literally “I am A”. First, we have the pronoun minä, or “I”. Then we have the first person singular form of the verb “to be” - olen. Last, we replace the A with our name or something else we want to say about ourselves. Gina:How was this phrase used in the dialogue? Paula:Both Helen and Liisa used it to tell the other person their name. So they said ‘Minä olen Helen’ and ‘Minä olen Liisa’. Gina:OK. So how would you introduce yourself? Paula:‘Minä olen B’. I just put my name after ‘Minä olen’. Gina:That’s simple enough. What else can you put in place of A? Paula:Well, you could have your profession there. Gina:So how would you say “I am a teacher”? Gina:Anything else you can have there? Paula:You can also have an adjective there that describes your state, such as “happy”, sad, surprised, hungry, and so on. Gina:I see. How would you say “I’m happy.”? Gina:Why don’t we have a little quiz for our listeners? Paula:Sounds like a great idea. Gina:OK, listeners! I’ll say a sentence in English, and you should try and say it in Finnish using this pattern. Say it out loud, because it’s very important to get into the habit of saying things is Finnish as early as possible. Paula:We’ll give you a few seconds before I give you the correct answer. Gina:OK, let’s go! First sentence - “I am Jukka”. Gina:Here comes the second sentence - “I am a doctor”. Paula:Here’s a hint for you - “doctor” is ‘lääkäri’ in Finnish. Gina:One more sentence - “I am hungry”. Paula:A hint - “hungry” is ‘nälkäinen’ in Finnish. Gina:Well, how did you do? Did you get them all right? Paula:I hope you did. Just remember the pattern ‘Minä olen A’, and you’ll be able to introduce yourself and say many more things about yourself. Gina:That’s it for this lesson. Next time we’ll learn to talk about other people, so stay tuned. In the meantime, make sure to check the lesson notes. Paula:Thanks for listening! Hei hei! Hi listeners! What is your name? I have just stumbled on your site and am very thankful for this first lesson. I have grown up hearing a lot of Finnish when my dad would speak with his parents but never learned myself aside from basic words as a child. I am keen to learn more and begin communicating with my dad in Finnish a bit! Thank you. Great to hear that you’re learning well with our lessons! We hope to see you often here! Throughout their lives. So, the sounds of Finnish are familiar and I can make my mouth do what it’s suppose to do to speak Finnish, and I know a few basic words and how to count to ten. What,s great is seeing the words spelt out so which helps with pronunciation and sounding out written words. Your program, after this first lesson, is really good. Thank you for studying with us. We hope you can soon speak Finnish with her! In case of any questions, please don't hesitate to contact us. Our team of Finnish language specialists have been releasing new audio and video lessons weekly. That&apos;s a lot of Finnish language learning! All new lessons are FREE for the first 3 weeks before going into our Basic and Premium Archive. Our team of Finnish language specialists have been releasing new audio and video lessons weekly. That&apos;s a lot of Finnish language learning! All lessons are free for the first 2 weeks before going into our Basic and Premium Archive. Having trouble staying on track? The Basic Lesson Checklist will help you stay organized and committed to your Finnish language goals! Having trouble staying on track? The Premium Lesson Checklist will help you stay organized and committed to your Finnish language goals! Don&apos;t have enough time for an entire lesson today? Listen to the Dialogue Only Track to hear the native Dialogue. Listening to a little bit of Finnish everyday, no matter how much, will greatly improve your listening comprehension. Guaranteed! Follow along to our award winning lessons with detailed PDF Lesson Notes! These easy to print notes take a closer look at the grammar point and vocabulary words presented in the audio lesson. Plus, read more about Finnish cultural topics related to the lesson. Sign up for your Free Lifetime Account and get even MORE Finnish language help with the PDF Lesson Notes today! Sit back and enjoy the FinnishPod101 video learning experience in all its fullscreen glory. Our Finnish specialists are consistently producing and releasing new video series, with all lessons free for the first 2 weeks before going into our Basic and Premium Archive. Want to read along and FULLY understand the Finnish in this lesson? Just turn on the Video Captions. You'll be able to read along as you watch – in Japanese or with English translations! Unlock our high definition video lessons that get you speaking, reading, writing and understanding Finnish in minutes. Clearer picture, clearer sound – all so you learn Finnish without missing a beat. Sign up for your Free Lifetime Account and learn Finnish with our fast, fun and easy video lessons. How good is your Finnish? Let’s find out! Test your language skills with assignments. Unlock interactive assignments that test you on all of the Finnish you've learned so far.